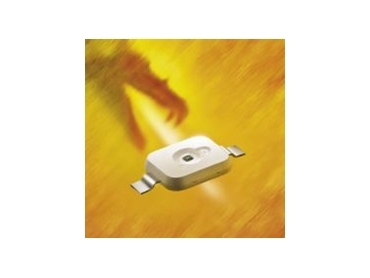 OSRAM Opto Semiconductors, represented by Braemac , is the first LED manufacturer to offer the high performance LED 'Golden Dragon' in the shape of a compact package. The powerful 1W point light source can be manufactured using standard SMT soldering techniques and this in turn opens up huge design potential for light developers and designers. In terms of reliability, this LED even meets the stringent demands of the automotive industry. The Golden Dragon delivers a concentrated light point with a high degree of efficiency (optical efficiency 20 lumens/watt) and yet it comes as a compact package. Nevertheless, it is larger in size when compared to conventional LEDs. With a chip size of 700um, it is more than twice the size of the Power TOPLED, which only measures 300um. The high performance LED is 0.8 - 1.8mm high and fits inside an enclosure measuring 6 x 7mm. In comparison, six Power TOPLEDs would be required to match the lighting intensity of a single Golden Dragon. This would represent a four-fold increase in space requirement if a conventional LED was used. The advantages of the high performance LED really comes to the core for space-restricted applications and where high optical power is required, or in applications where light has to be coupled with transparent materials. Potential applications for this new technology are for example, in the reverse lamps for vehicles, lighting of traffic signals and even for special lighting applications in the general lighting field. Other possible applications include the backlighting of displays, such as for TFT and LCD Displays, and also for indoor and outdoor advertising signs. The Golden Dragon high performance LED has been specifically designed for high volume production and can be manufactured in standard SMT reflow soldering processes.